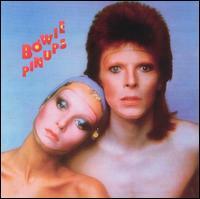 Pin Ups is an album by David Bowie containing cover versions of songs, released by RCA Records in 1973 (see 1973 in music). It was his last studio album with the bulk of 'The Spiders From Mars', his backing band throughout his Ziggy Stardust phase; Mick Woodmansey was replaced on drums by Aynsley Dunbar. Pin Ups entered the UK chart on November 3, 1973 (1973-11-03) (coincidentally the same day as Bryan Ferry's covers album These Foolish Things) and stayed there for 21 weeks, peaking at #1. It re-entered the chart on 30 April 1983 (1983-04-30), this time for 15 weeks, peaking at #57. In July 1990 (1990-07) it again entered the chart, for one week, at #52.